Mouse lung epithelial cells infected with influenza are marked by the expression of NS1 (magenta). 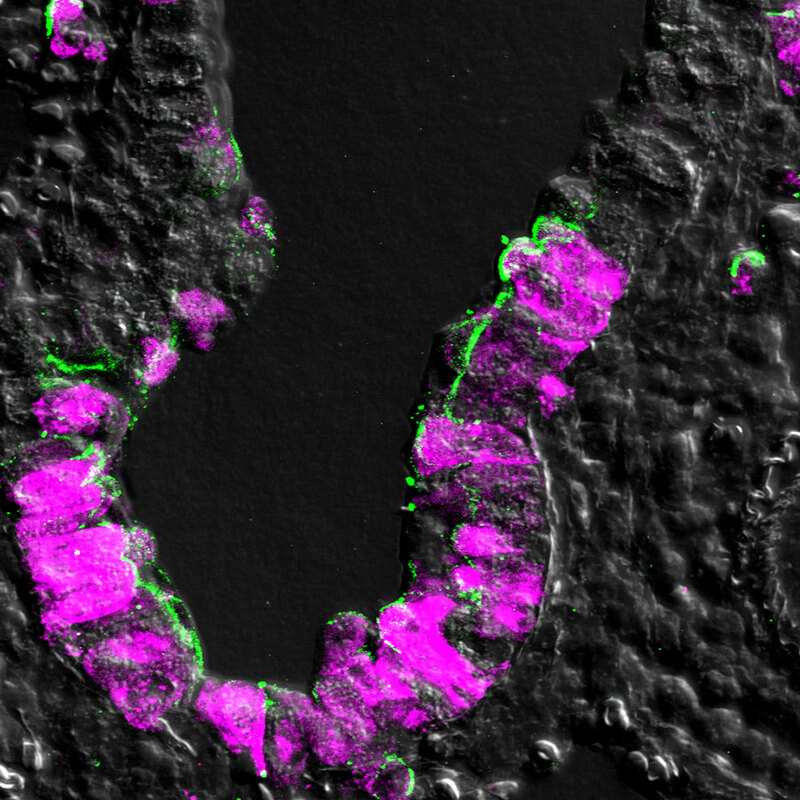 These cells augment expression of the Hedgehog target gene, Patched-1 (green). 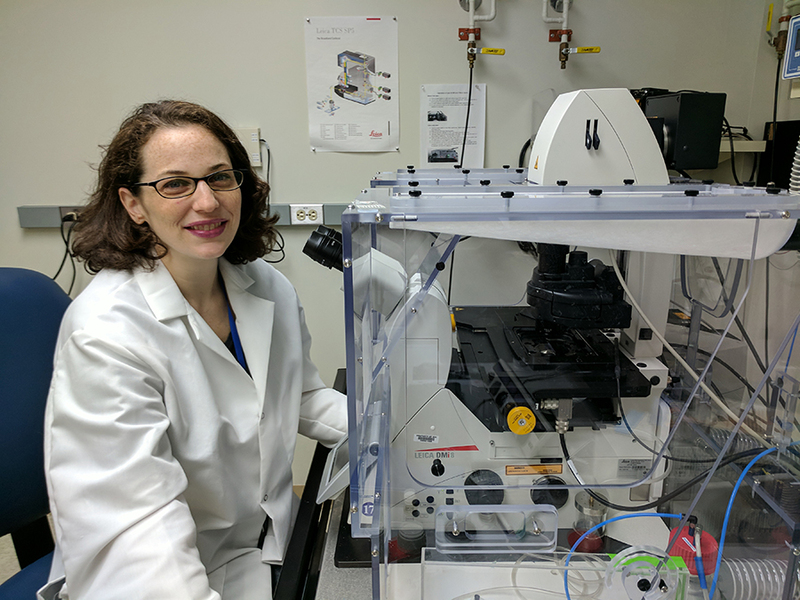 Published a month apart in PLOS Pathogens, the studies from Professor Ethan Bier’s laboratory used a series of experiments to identify key pathways and mechanisms previously unknown or overlooked in the body’s defenses. The first study used fruit flies as an in vivo test system to reveal new evidence about the function of a key influenza protein called NS1, which has evolved to target molecular pathways in the host. Research led by Margery Smelkinson found that NS1 modulates the activitiy of a signaling cascade known as the Hedgehog pathway (so named because fruit fly larvae lacking the Hedgehog gene emerge hairless and resemble tiny hedgehogs). “Margery’s experiments showed that the NS1 protein can alter expression of Hedgehog target genes on its own, without other viral proteins,” said Bier, professor and newly named holder of the Tata Chancellor’s Endowed Professorship in Cell and Developmental Biology. “The clinical implications of this work are that we might be able use existing drugs that alter Hedgehog signaling to treat influenza infection,” said Bier. The UC San Diego researchers set up collaborations to achieve their findings, including: Krug at the University of Texas at Austin, who generated the influenza virus mutant encoding the mutant NS1 protein; and John Teijaro and Michael Oldstone at the Scripps Research Institute, who carried out mammalian pathogenesis studies with the wild-type and mutant influenza virus. The second study(cover of the latest issue of PLOS Pathogens) describes new findings by Annabel Guichard and her colleagues that could open the door to much needed intervention for treating late-stage anthrax infection. Anthrax poisonings, as well as cholera infections, work in part by disrupting the normal transport mechanisms of proteins. The researchers analyzed the processes by which proteins that normally bind cells together are blocked by an anthrax toxin named edema factor (EF). This mechanism halts the delivery of the “glue” for key cell sheets—blood vessels for anthrax and intestinal lining for cholera—which results in blood loss-induced shock (anthrax) and acute diarrhea (cholera). 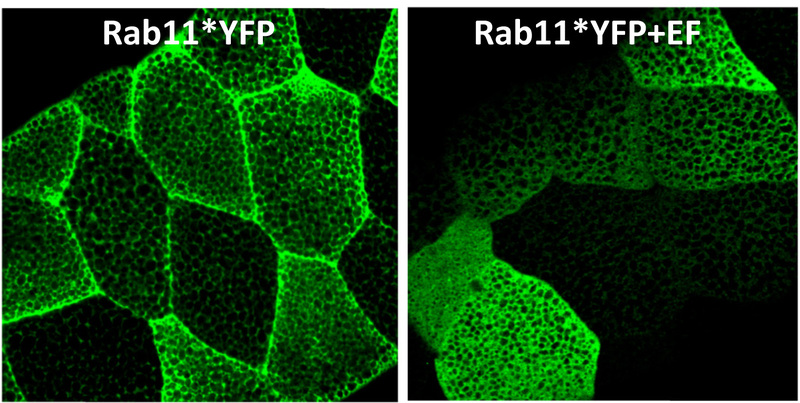 Drosophila salivary glands expressing an activated form of Rab11, a protein critical for shuttling adhesion molecules to cell-cell junctions. EF, an anthrax toxin, prevents Rab11 from reaching its normal destination, resulting in junctions weakening. Guichard and her colleagues further identified several molecular inhibitors critical to mediating these effects and tested them in mice with positive results. Coauthors of the influenza paper included Meghana Malur, Maria Loureiro, Prashant Jain, Sundar Ganesan and Elina Zúñiga. The study was supported by grants from the National Institutes of Health (NIH) (grants F32AI078672, AI070654, AI011772, AI74564, AI007354, AI081923 and AI081923) and the American Heart Association (fellowship 11POST7430106). Coauthors of the anthrax paper included Prashant Jain, Mahtab Moayeri, Ruth Schwartz, Stephen Chin, Lin Zhu, Beatriz Cruz-Moreno, Janet Liu, Bernice Aguilar, Andrew Hollands, Stephen Leppla and Victor Nizet. The research was supported by the NIH (grants R56 AI070654 R01 AI110713; the Intramural Program of the NIH, National Institute of Allergy and Infectious Diseases (grant 1 ZIA AI001032-08).